It's not everyday that you get to meet a great artist. I was lucky enough to meet Richard Neubauer, first and foremost as my friend Jenn's father, but also as the artist that he was. I was exceptionally lucky to get to get a chance to learn about the man behind the paintings through multiple meetings, interactions, and family stories. And equally lucky to see and enjoy so many photographs of his work over the years. 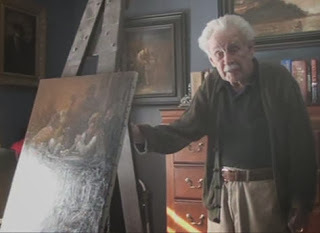 Sneak peek from the York Dispatch video below: "Age of Knowledge, Look Back at a Career"
Richard was a self-taught, Rembrandt-style artist. He drew a lot of his inspiration from the numerous books he read, and countless hours studying paintings at the Smithsonian National Gallery in Washington, DC. He was kind, witty, humble, and a wonderful husband and father. A painting must start with good composition. your canvas in a pleasing manner." This captivating video, "Age of Knowledge, Look Back at a Career," was put together by the York Dispatch. Do yourself a favor and watch it. You can admire more of his work on the Art of Richard Neubauer Facebook Page.